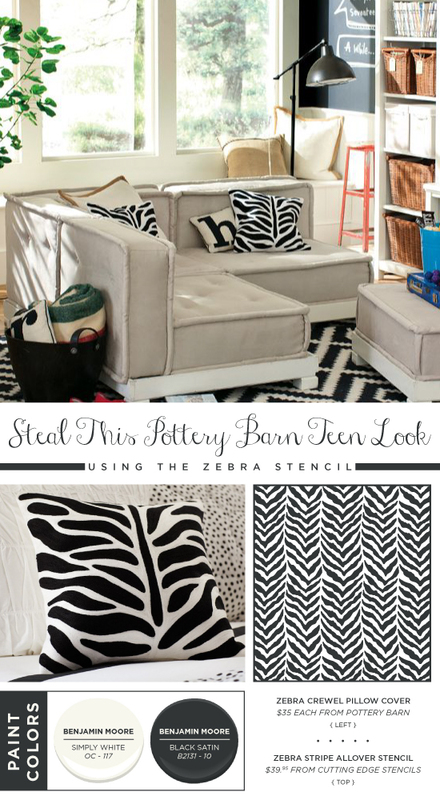 Stencils Can Recreate Your Favorite Pottery Barn Teen Looks! Happy Thursday, my DIY decorating friends! We know it’s only the beginning of August, but Pottery Barn Teen already has us thinking about being back to school cool. Cutting Edge Stencils is willing to bet that your teen is probably wild about the patterns featured in the new catalog. We are too! But what we’re not wild about are the $$$ noted next to those trendy items. Today we’re going to show you how to use our stencils and Benjamin Moore paint colors to recreate some fabulous Pottery Barn Teen looks. But wait, it gets better. 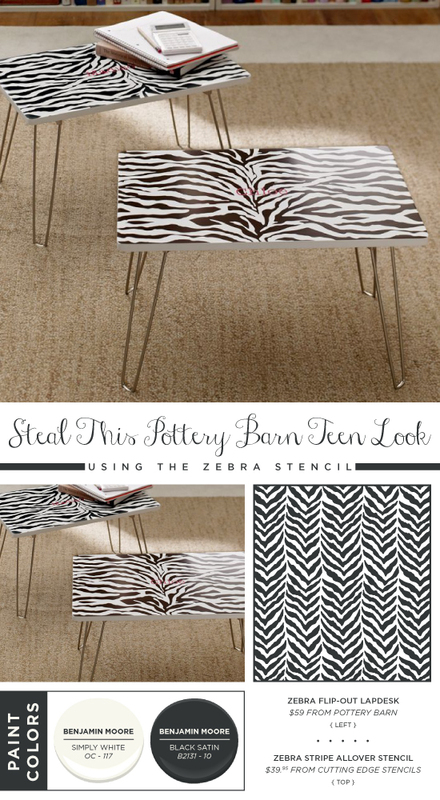 We’re going to show you how to steal multiple looks using one stencil, the Zebra Allover pattern. We can totally see what all the stripe hype is about after catching a glimpse of this zebra patterned pinboard. STEAL THE LOOK: There’s one thing we’re not wild about and that’s the $79 price tag. Good thing we’re always wild about a fun DIY project. Purchase a plain jane pinboard. Then paint our trendy Zebra Allover ($39.95) in Benjamin Moore’s black satin 2131-10 and simply white OC-117 on a piece of white fabric. Attach the fabric to get a similar look. 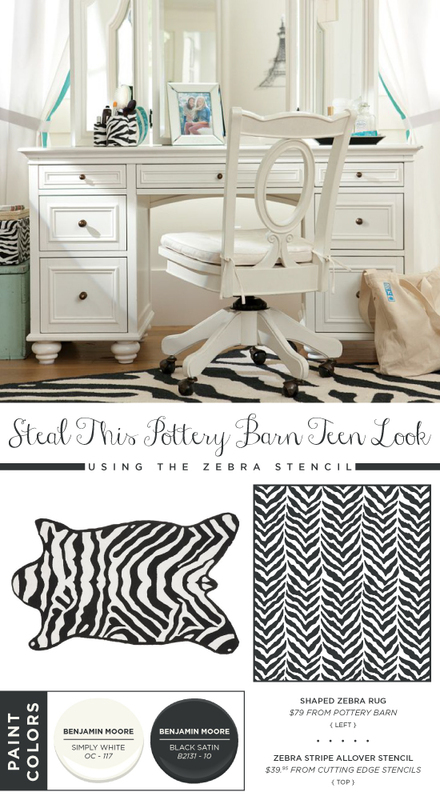 What’s not to love about the black and white Zebra Flip Out Desk? This might possibly be the best dressed lap desk, thanks to the eye-catching pattern. STEAL THE LOOK: Don’t have $59 to shell out for a lap desk? We can help you get that look for a whole lot less and you’ll get to reuse the stencil from the last project. Recreate this look using a plain lap desk, like that one you spotted on sale at Walmart or Target. Paint the top white and then stencil our Zebra Allover in Benjamin Moore’s black satin 2131-10. Homework never looked so good! 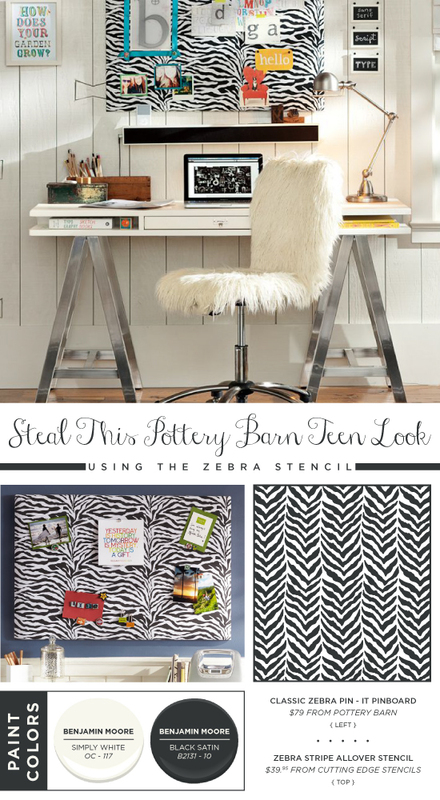 We bet this racy Zebra striped pillow will have you racing to buy one! It’s stylish, cool, and adds instant ambiance to any teen bedroom. Whoa, one zebra crewel pillow cover costs $35. Yikes! STEAL THE LOOK: Have no fear, because stealing this look with a stencil is going to be easy peasy! The best part about recreating this pillow is that you can reuse the same stencil from your previous projects. All you have to do is purchase a plain white pillow sham and then stencil our Zebra Allover pattern in a classic, black hue like Benjamin Moore’s black satin 2131-10. 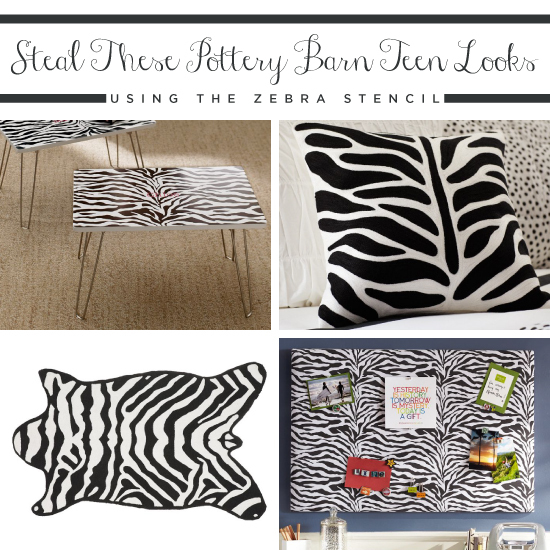 Take your teen’s room for a walk on the wild side with this shaped zebra rug. If the $79 price tag is a bit too wild for your wallet then we have an idea! STEAL THE LOOK: This project is totally doable using the same exact stencil that you used for the other projects. Just remember to keep washing the stencil after each use and you’ll have lots of life left in it. Purchase a plain white rug and paint our Zebra Allover pattern in a black hue like Benjamin Moore’s black satin 2131-10. Which of these Pottery Barn Teen inspired looks would you be most likely to “Steal”? Leave us a comment below! Looking for more stencil fun? Shop our stencils and find the perfect one for your project! Follow us on Pinterest to see awesome inspirational photos!